Ancestra Anejo Extra Suave Tequila is 100% Blue Agave, rested a minimum of one year in oak barrels. 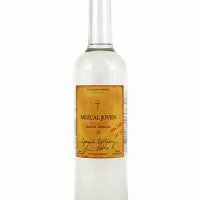 It is bottled in hand-blown, multi-colored glass, and contains a stamped metal label. After reading sdnerf's review, I thought that it would be right up my alley. It definitely was. It was everything that I expected it to be. The nose is light, but really interesting. The body is wonderful and the finish is exactly what you want. Aroma: Light agave, vanilla and spice. Body: The spice notes and oak start coming through to compliment the agave sweetness. It's a very smooth drink that sits nicely on your palate and allows you to taste each and every flavor. Finish: A wonderful combination of really mild burn and spice. The sweetness and cinnamon sort of flavors linger nicely. This bottle is really well priced at $40. The bottle is old school class with the cork top and label. It's not a piece of art like a lot of bottles, but it looks nice on the shelf and keeps a top notch juice inside. 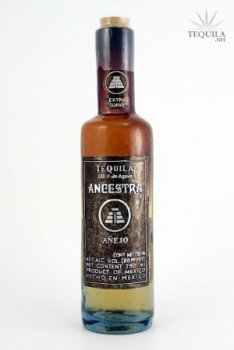 Purchased Ancestra extra anejo NOM-1506 5/7/10, online paid $40. First off, this Tequila can not be beat for the $. This is the best Anejo for price/quality next would be Dos Lunas. I have seen this product many times and passed on it for no particular reason other than that it does not come from a "big" distiller. Big mistake, wow what a nice surprise! Sampled from a 6oz shoot glass neat. Bottle is great, semi old school with a cool, big cork top and stamped metal label. Nose is light agave, minimal alcohol. Color is straw, thin on the sides and will gather to small tears. Medium/thin in the mouth, very smooth and comes in almost too easily, but settles nicely, you'll have a mouth full before you know it! Not real complex but if you love agave you'll cherish this anejo. Pure agave without a lot of distractions, no barrel/oak residue, just smoothed with time, a feat not often replicated with this kind of alacrity. There is nothing added to pollute the agave. Medium mouth feel, with minimal heat on the way down but some heat in the finish, a very nice touch. From the moment you pour it into the glass it just keeps on getting better, you'll dig it! Smooth you ask... come on, this is pure agave with nothing to get in the way, of course it's smooth. This is an anejo I'll share with good friends...it's a keeper!